Note: The license policies work analogously to the permission policies: Define once, use for multiple admins. To make it short and comprehensible, see the old and the new Delegate365 license policies at a glance here. To Delegate365 version 8.0, in Administration / manage administrators, for each admin a set of license restrictions could be defined, depending on the available licenses in the Office 365 tenant, similar as here. 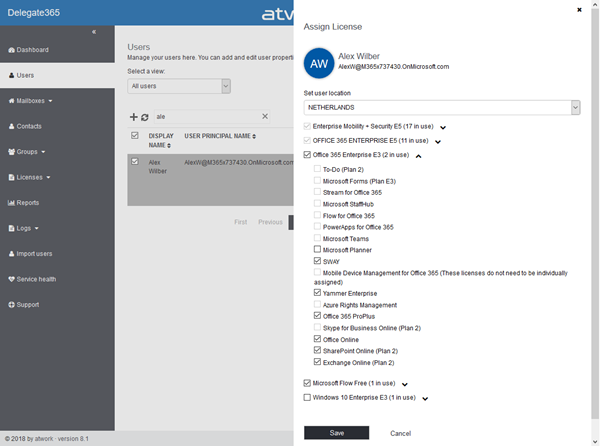 Such a license setting caused that the Admin, here AdeleV, only can manage specific plans of the E3 license and the licenses Microsoft Flow Free and Win10_VDA_E3. Other licenses or plans cannot be selected by AdeleV for her users. The benefit here was, that setting license restrictions was very quick and manageable for Portal Admins. But, it had to be done for each admin. We changed that to make the licenses restrictions easier to manage. 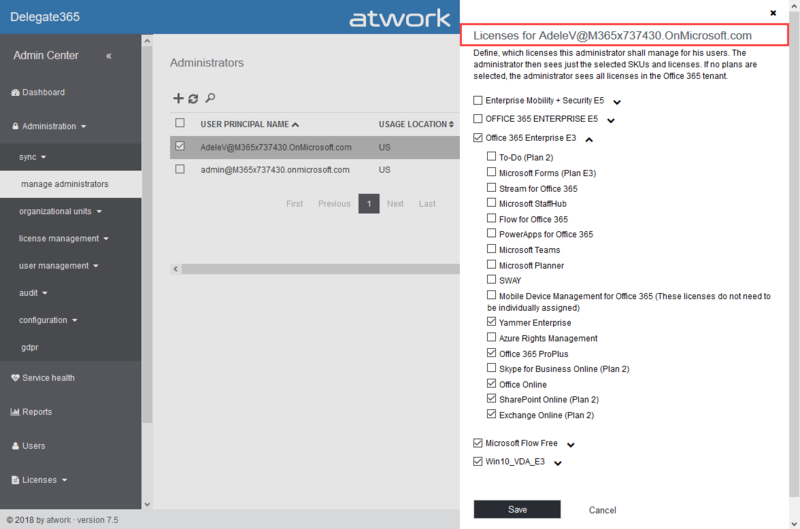 With Delegate365 version 8.1, there come license policies. Each administrator can to have one license policy assigned in Administration / Administrators / Edit license policy. The assigned license policy defines the set of licenses, that administrator gets. To keep it as simple as possible, only one license policy can be set per admin. A huge benefit here is, that licenses can be defined in a central place once (as follows) and affect every single admin who has that license policy assigned. This reduces the work for Admins and allows to modify the underlying license policy anytime easily. When Delegate365 has been upgraded to version 8.1, the existing licenses sets are converted automatically to a license policy for each administrator. This ensures that existing license restrictions are 1:1 converted to the new license policies. The converted licenses get the name of the administrator account (UPN) as here. When converted, a license policy is created for administrator AdeleV with the same name. Of course, to benefit from the "Define-once-apply-to-multiple-admins" feature, we recommend to check the licenses and to reunite licenses as much as possible. So, it would make sense to create a licenses policy for a region, or OU's or for admin-roles. See here, how to modify a licenses policy. License policies allow to granularly define what licenses the admins can use within Delegate365. The licenses policies list shows the existing policies and how many admins are assigned to each policy, as in column Assigned. Admins see at a glance, what policies are active and what policies are not used. To define a license policy, open the Policies / License Policies menu as here. Create a new policy or edit an existing one as usual in Delegate365 with the Plus icon or by selecting a row and clicking Edit policy. By default, there are no license policies defined – no license restrictions for any admins. If updated from a previous version, there will be a policy for each admin. The license panel opens on the right side. Each policy requires a policy name. The policy name can be modified anytime as needed and does not affect any existing assignment. Adapt the license policy as needed. 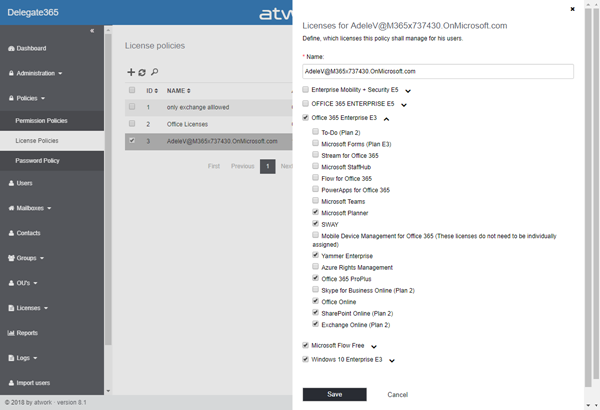 The licenses are depending on the licenses available in the Office 365 tenant. Admins can define what licenses shall be available for other admins that have that license policy assigned. When an underlying license policy is changed on the fly, the assigned admins see the new set immediately when they open the licenses for their users. As result, AdeleV can only manage the licenses that are defined in her assigned license policy. If the user already has other licenses set, they are selected, but AdeleV cannot modify other licenses than she is allowed to manage. The allowed licenses checkboxes are active, while the not allowed licenses are inactive. This allows Admins to fully control the licenses that shall be used by Scope Admins. License policies act as additional restriction for Admins to OU and domain-assignments. With the new license policies, Admins can granularly control what licenses other Delegate365 Admins can see an use for their users. We recommend to create the required license policies in an organization and to delete personal and unused license policies. Once this is done, there's one central module to restrict or extend licenses with a mouse click for all administrators. We think the new license policies make a lot of sense in Delegate365 and we hope, you like them, too!